Part of the attraction of using technologies like d3.js is that it expands the scope of what is possible in a web page. At the same time, there are many different options for displaying content on a page and plenty of ways of interacting with it. Some of the most basic of capabilities has been the use of HTML entities that allow the entry of data on a page. This can take a range of different forms (pun intended) and the <input> tag is one of the most basic. What is an HTML input? An HTML input is an element in HTML that allows a web page to input data. There are a range of different input types (with varying degrees of compatibility with browsers) and they are typically utilised inside a <form>element. text: A simple text field that a user can enter information into. radio: Buttons that let a user select only one of a limited number of choices. range: A slider control for setting a number whose exact value is not important. number: A field for entering a number or toggling a number up and down. … and many more. To check out others and get further background, it would be worth while visiting the Mozilla developer pages or w3schools.com. While d3.js has the power to control and manipulate a web page to an extreme extent, sometimes it’s desirable to use a simple process to get a result. The following explanations will demonstrate a simple use case linking an HTML input with a d3.js element and will go on to provide examples of using multiple inputs, affecting multiple elements and using different input types. The examples are deliberately kept simple. They are intended to demonstrate functionality and to provide a starting position for you to go forward :-). The first example we will follow will use a range input to adjust the radius of a circle. The following is the full code for the example. A live version is available online at bl.ocks.org or GitHub. It is also available as the file ‘input-radius.html’ as a separate download with D3 Tips and Tricks. A a copy of most the files that appear in the book can be downloaded (in a zip file) when you download the book from Leanpub. As with the other examples in the book I will not go over some of the simpler lines of code that are covered in greater detail in earlier sections of the book and will concentrate on those sections that contain new concepts, code or look like they might need expanding :-). The entire block is enclosed in a paragraph (<p>) tag so that is appears on a single line. It can be broken down into the label that occurs before the input slider which is given the id nRadius-value and the input proper. The for attribute of the label tag equals to the id attribute of the input element to bind them together. This allows us to update the text later as the slider is moved. The ids supplied for both the label and the input are important since they provide the reference for our d3.js script. We append an SVG element to the body of our page and then we append a circle with some particular styling to the SVG element. We select our input using the id that we had declared earlier in the html (nRadius). Then we use the .onoperator which adds what is called an ‘event listener’ to the element so that when there is a change in the element (in this case an adjustment of the slider of the input) a function is called (function()) that in turn calls the update function with the value from the input (+this.value). We haven’t seen the update function yet, but never fear, it’s coming. This might seem slightly redundant, but unless the function gets a value, the text associated with the range input doesn’t get a reading and remains on ‘…’ until the slider is moved. The first part of the function selects the label associated with our input (with the id, nRadius-value) and applies the vaule that has been passed into the function (nRadius). The next line selects the input itself and applies the value to it (this would be the equivalent of having value="<number here>" as a property in the html). Lastly, we select the circle element and apply the new radius value based on our input value nRadius(.attr("r", nRadius)). And there we have it, a fully adjustable radius for our circle controlled with an HTML input. In this example we will use two separate inputs (range type) to adjust the height and width of a rectangle. This is not too much of a stretch from the previous single input example with the radius of a circle, but it may be useful to reinforce the concept and illustrate something slightly different. The following is the full code for the example. A live version is available online at bl.ocks.org or GitHub. It is also available as the file ‘input-double.html’ as a separate download with D3 Tips and Tricks. A a copy of most the files that appear in the book can be downloaded (in a zip file) when you download the book from Leanpub. For the sake of brevity, this explanation will simply concentrate on the differences between the previous single input example and this one. The only significant difference is the declaration of the id’s for each input and it’s respective label. Again the only substantive difference is the use of the appropriate id values. The rectangle is selected using a common rect designator, so multiple rectangles could be controlled. But each function controls only a specific attribute (height or width). This example is really just a derivative of the adjustment of a single attribute of an element. I happen to think it’s just a little bit ‘neater’ because it includes text, but in reality, it’s just another attribute that can be adjusted. Here we let our range input adjust the rotation of a piece of text. We’ll dispense with the full code listing since it’s just a regurgitation of the adjusting of the radius of the circle example, but the code for the example is available online at bl.ocks.org or GitHub. It is also available as the file ‘input-text-rotate.html’ as a separate download with D3 Tips and Tricks. A a copy of most the files that appear in the book can be downloaded (in a zip file) when you download the book from Leanpub. we have set the step value to speed things up a bit when rotating, but it’s completely optional. The input itself can be adjusted up or down using a mouse click or have a number typed into the input box. This type of input is slightly different from the range type since it isn’t fully supported under Firefox and as a result when I was testing it the arrow keys for going up and down weren’t present. The full code for the example is available online at bl.ocks.org or GitHub. It is also available as the file ‘input-number-text.html’ as a separate download with D3 Tips and Tricks. A a copy of most the files that appear in the book can be downloaded (in a zip file) when you download the book from Leanpub. The final example looking at using HTML inputs with d3.js incorporates a single input acting or two different elements. This might seem self evident, but if you’re as unfamiliar with HTML as I am (it’s embarrassing I know, but what can you do?) it may be of assistance. The end result is to produce a single slider as a range input that rotates two separate text objects in different directions simultaneously. The following is the full code for the example. A live version is available online at bl.ocks.org or GitHub. It is also available as the file ‘input-text-rotate-2.html’ as a separate download with D3 Tips and Tricks. A a copy of most the files that appear in the book can be downloaded (in a zip file) when you download the book from Leanpub. The explanation for this example differes from the others in the way that the d3.js elements (the two pieces of text) are initially appended and then updated. … both elements are declared with a class attribute that serves as a reference for the future updating. 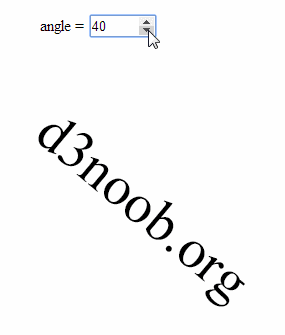 Here, the text ‘d3.js’ is given a class name of d3js and the text ‘d3noob.org’ is given a class name of d3noob. So the ‘d3.js’ text is selected using text.d3js and ‘d3noob.org’ is selected using text.d3noob. That’s a pretty neat trick and a good lesson for applying specific transformations to specific objects. Hello, I am very new to d3 and svg, so please forgive me if the question is dummy. I tried the example of "range input" with the slider and a circle. It works beautifully in Firefox but does not in IE11. Is there some sort of configuration that enables the same d3 code in IE11 or IE11 simply does not support the magic used in the example ? I am not sure if my first post was ever published (cannot see it below this article) but it was about the slider example (with circle) not working. Specifically, I could not see the circle being painted. Well, I have found out that original example uses d3 v3. As soon as I changed to refer v4 I got the circle painted in IE11. However, it looks like even with version 4 of d3, there is an issue in IE 11 related to firing "onchange" event. The one assigned using d3 syntax does not work, so I hooked up the event directly to html "input" element and got it working. I expected that d3 somehow works around browser-specific issues and same d3 code can be used for all. Is this expected or not - could you please comment ? Thank you. Thanks for your questions and my apologies for not replying quickly. I am seldom able to be particularly quick on turning around questions I'm afraid. None the less, well done on working round the problem and your observations on cross browser support are interesting. This topic has been thrashed about quite a bit and from the outset, d3 appears to have taken the position that they will support a particular standard in relation to using svg in a browser and in IE has not necessairly been able to support those standards in some of their earlier versions. From what I understand this is improving, but it's not really an aim for d3 to work around browser specific issues as much as to support a browser standard. If browser manufacturers don't support the standard then there will be 'issues'. Having said that I believe that there is scope for mitigating some of these problems in html, but they are certainly outside my skill set I'm afraid. The link here (http://stackoverflow.com/questions/15159002/d3-js-browser-support) has some additional details.